The Tal & Tar Vacuum tables are an ideal partner to our Gak steam generator, or other steam generators, and are used when you require a dry, clean, pressed garment. 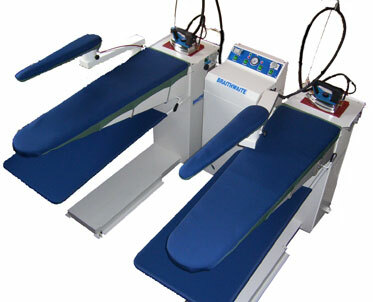 They are fitted with an electrically heated ironing surface which is thermostatically controlled to help reduce pressing dampness and a powerful self-contained vacuum motor: which draws the steam through the garment giving professional finished results which last longer and are quicker to achieve. As standard they come with a floor level foot kick plate, which operates the vacuum, leaving both hands free and a high temperature iron rest. 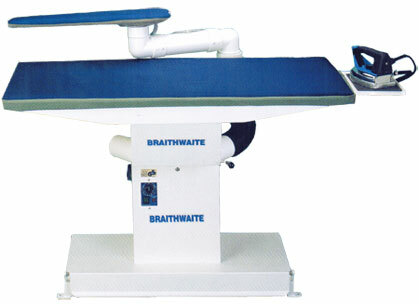 In addition the Tal vacuum table is fitted with a lower garment tray which is used for work in progress or to keep larger garments from touching the floor. Optional add-on equipment includes: Heated swing away arm kits - different shaped arm bucks - overhead suspension kits - overhead lighting kits and specially made to order options include: 3phase versions - vacuum and blowing versions. TAL-H & TAR-H height adjustable tables. Also Available are Models: TAL-H & TAR-H fully height adjustable tables. These are similar to the TAL & TAR tables and come fitted with a spring assisted, height adjusting column, which has a large range of setting. This allows you to set the tables working height to suit an individual operator including: the tall or small user, who may find other restricted height tables uncomfortable when used for long periods of time. 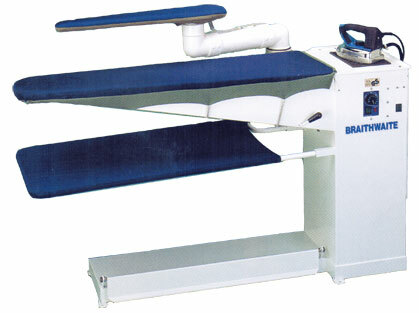 Tal & Tar vacuum pressing/ironing table for use alongside industrial steam irons. Designed & manufactured in Europe to strict quality standards.